Koh Samet (Also written Koh Samed), Thailand. The perfect weekend getaway from Bangkok. There are quiet, out-of-the-way beaches. Or you can stay where I always go, the best white-sand beach, Sai Kaew Beach. It’s the mini-Boracay Beach of Thailand. Not as scenic as Koh Phi Phi or El Nido (Phils) — but an amazing place to chill that is only a couple hours drive and a short ferry ride from Bangkok. Read on! First, you need to get from Bangkok to the Ban Phe pier in Rayong. You can hire a taxi for as low as 1,500 baht ($50ish) if you know what you’re doing, or a lot more if you don’t. Or you can bus it from the Ekamai Bus Terminal (at BTS Ekamai station) for a few hundred baht. 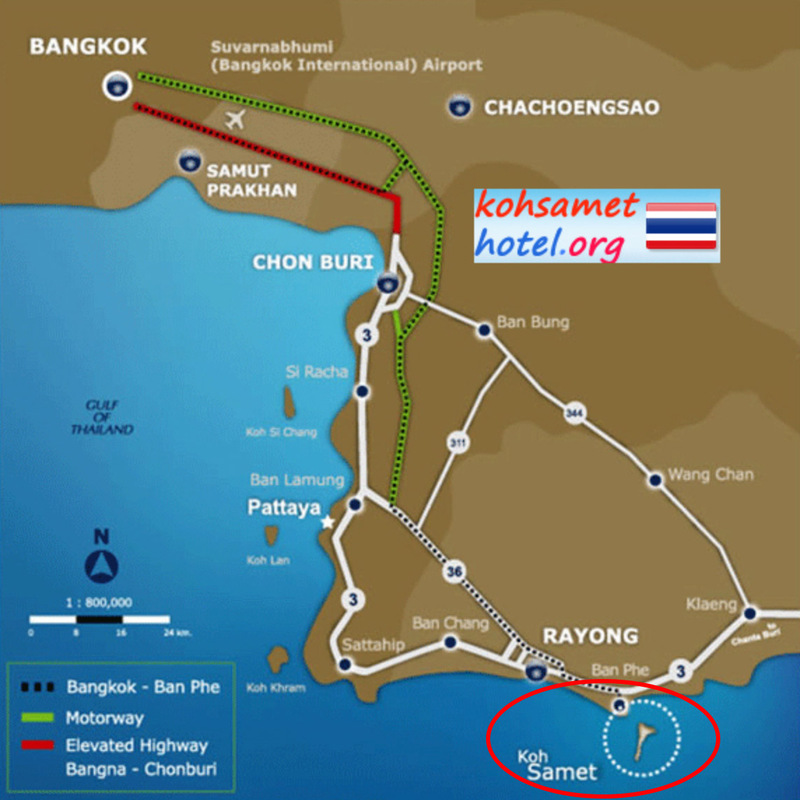 As shown on the map, Koh Samet is about 220km from Bangkok. This can take anywhere from 2 to 4 hours to drive, depending on traffic and on how much Red Bull your driver has consumed. Just make sure whoever you drive with has seat belts. Given the huge amount of traffic accidents in Thailand, no seat belt should be a deal breaker. Once you get to Ban Phe, there are several piers, all of which have 40-minute slow-boat service to the island. These boats are very cheap — usually around 100 baht one-way. If you’re in a hurry, you can hire a speedboat, although you’ll be looking at about 1700 baht for that, although I’ve done it for as low as 700. The cool thing about taking a speedboat is that if you’re going to a remote beach, you can get there without paying the park entrance fee, so the price averages out if there are a few of you in the boat. Of course, there might be a ranger waiting as your boat pulls in, but I like the gambling feeling of never knowing. 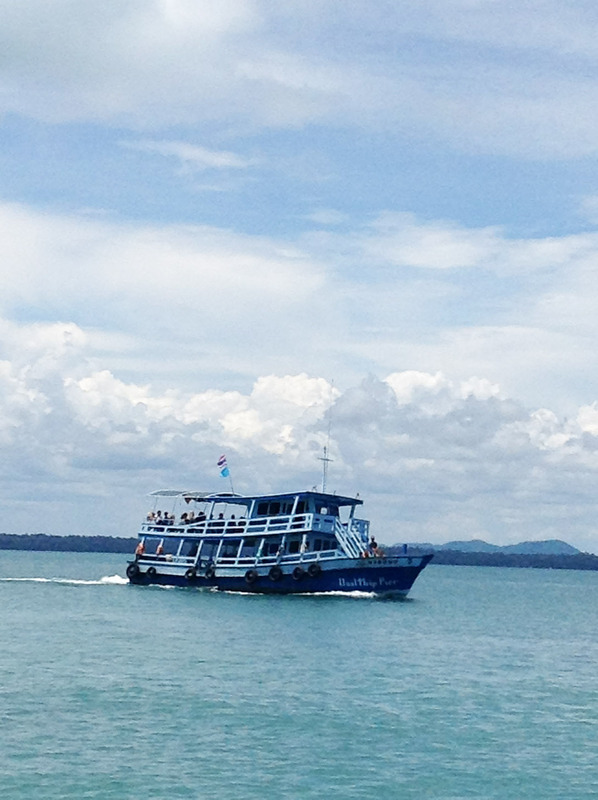 The slow-boat to Samet takes about 40 minutes. Note that the listed park fee for foreigners is 200 baht. Sunrise doesn’t look like much and the rooms are super basic aircon rooms. But it’s a friendly place that is quiet at night, it’s cool during the day, and all of our group who stayed there barely went to the main beach, preferring to chill and read on our balconies built onto the rocks overlooking the ocean. Super good location and nice, albeit simple, wood air con semi-detached bungalows. But don’t stay in the beach fronted bungalows. They are actually older and not as nice, in spite of being priced higher. They’re also nosier at night. Get a room a bit deeper into the resort. Silver Sand is on Ao Phai, the beach directly south of Sai Kaew. You can get cheaper places there, and the beach is still OK. It’s also close to the beach front restaurant at Jep’s Bungalows, which is my favorite sunset beers place (look for the stars in the trees). BUT, it’s close to some night clubs on the beach that go until late at night. So if you’re going for peace and quiet, don’t stay here. If you plan to party and want to be central in a nice place with good rooms, this is the place to be. If you are looking for a white-sand beach, then Hat Sai Kaew Beach is where you’ll want to be. This is the longest stretch of beach on the island and is loaded with resorts ranging from about 1,500baht/room to crazy-expensive. Here’s a quick look at Sai Kaew by day and by night. To get to Sai Kaew, take a song taew (an open pick-up truck) from the ferry pier 10 minutes to the park main entrance. That’s basically smack in the middle of Sai Kaew Beach. For those who want to escape the crowds — particularly on weekends when the island gets pretty busy — there are plenty of smaller beaches dotting the coast all the way to the narrow tip of the island. Ao Wong Duean gets good reviews from people who like a bit of tropical peace and quiet. 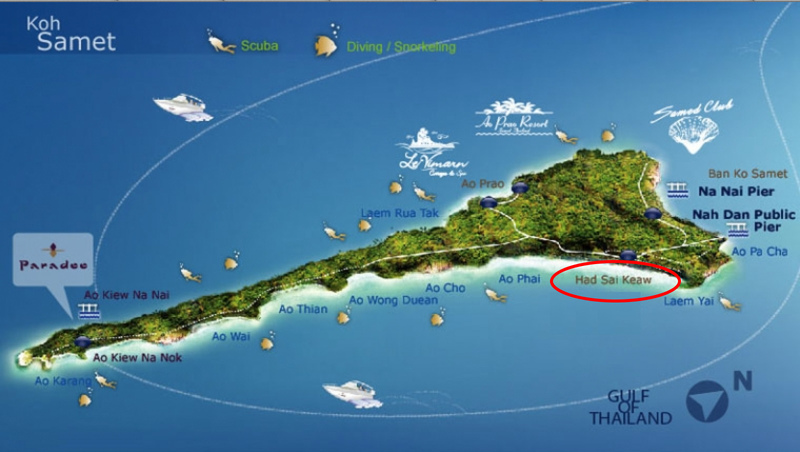 Note that the Sai Kaew (east) side of the island is NOT the one which had the oil slick in 2013. That was on the west side. Sai Kaew Beach is as pristine as ever. Or at least as pristine as one can expect for water in the northern Gulf of Thailand. In most of the major beach areas, there’s plenty to do by day. You can catch some rays, get a massage on the beach, rent scooters and explore the island, swim, jet ski (watch out for jet-ski scams! ), snorkel, or just chill with beers in the shade. For me, a ritual on arrival is to walk to Jep’s Bungalows and have my favorite food on earth, gaprau gai kai dao — Stir fried chicken in basil with rice with a fried egg on top…and a cold Chang beer. Yes, in my world, beer is a legitimate food group. Gaprau gai is a staple of Thai cuisine. It goes great with Chang beer. 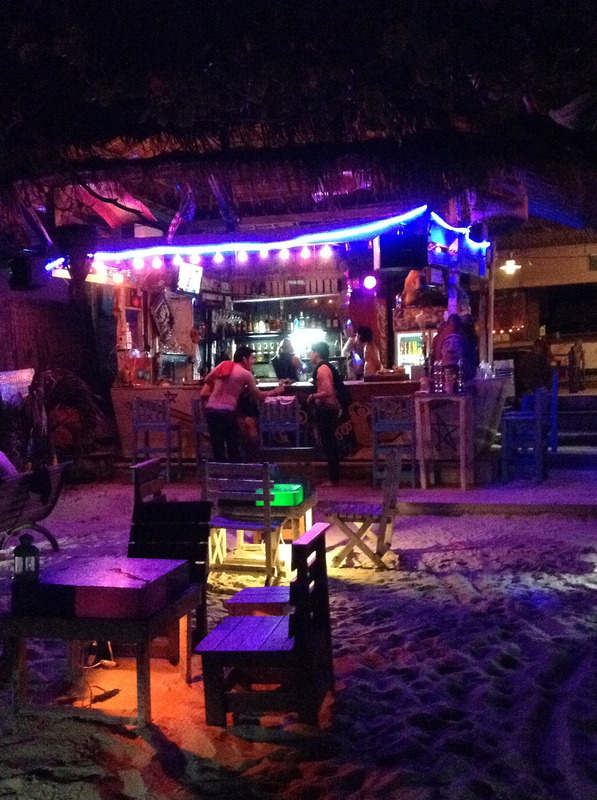 Jep’s is located on Lung Jeb Beach, 15 minutes walk south of Sai Kaew. Just keep walking until you find the tree with the stars in it. Jep’s Restaurant. Just look for the stars on the trees. Koh Samet really comes to life after the sun goes down. Head south till you get to the Ploy Talay restaurants. Don’t eat at the one with the fireshow (see video above). That restaurant is one of the slowest and worst on the island. Go past that till you get to the quieter ones. 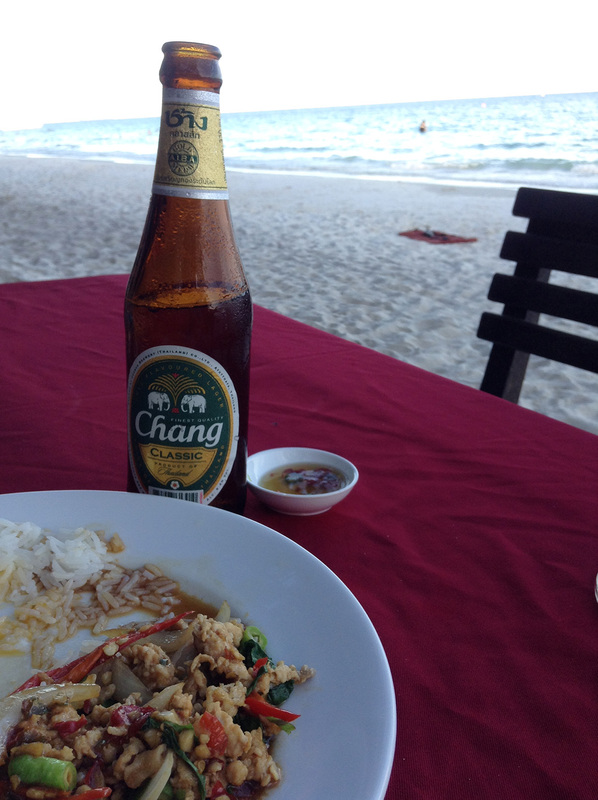 Enjoy some Thai food and drinks with your bare feet in the sand. Then go back and enjoy the fireshow after dinner. And a Samet restaurant tip — Always choose from the plates laid out to be BBQed. You’ll get your food fast. Order off the menu and you’ll likely give up and leave long before your food arrives. Once the fireshow is over, all the package tourists will turn into pumpkins and head home. After that, the beach is mostly populated by people who love to chill over beers to cool Ambient Trance or Deep House, or in some cases Thai music. Either way, you’re mere meters from the waves, so the feeling in incredible. The bar below, right up on the north end of Sai Kaew, was our favorite. The Rehab Bar. The seats weren’t the most comfortable — but the staff were great, the beers cold, and the atmosphere awesome. And when the sun finally rises, you stroll up the beach and get some sleep. A few hours later, you get up and have some late breakfast to a gorgeous view… and prepare to do it all over again! Enjoy Samet! Let me know if you have any questions or information to add about Samet in the comments section. Thanks for stopping by! ← Sai Kaew Beach Resort, Koh Samet. Why –NOT– to stay there. Bangkok is definitely too busy and noisy. After a week we felt so bored and tired of it so we decided to head to Kho Phangan Island. 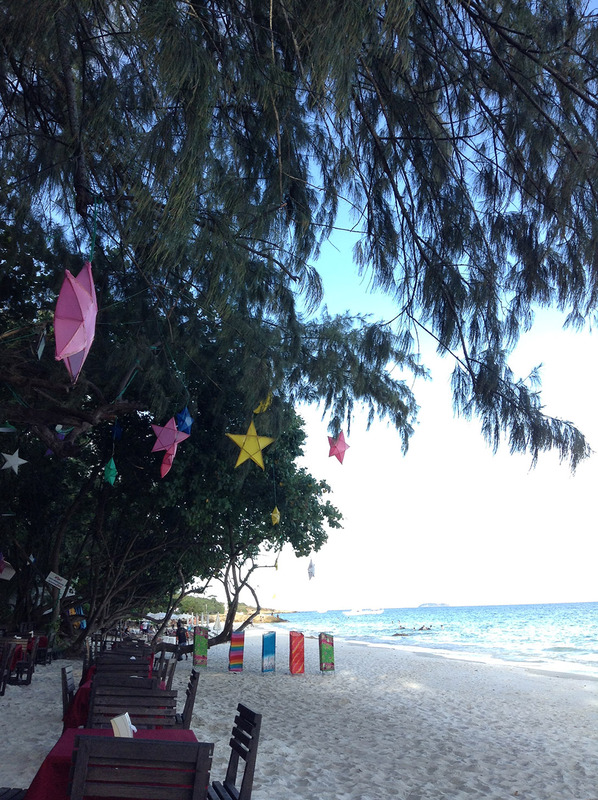 We missed Koh Samet Island, we actually never heard of it, but it’s a beautiful island indeed judging by your photos. Gosh, I miss Thai food a lot!! Cool. How was Phangan? I’ve never been there. I’m not really a full-moon-party kind of guy so I’ve never really felt like checking it out, although I hit Samui and Koh Tao. So did you do the full-moon party? Thanks for stopping by. I just checked out your “First Flight.” Awesome!! Keep those great blogposts coming! 🙂 And enjoy Samet in December. It’s the best time to be there. I, on the other hand, will be in Manila for a few weeks; hopefully with a side trip to Boracay if I can get flights and a hotel! Chori burger…what area is that? Station 2 area? They actually have it pretty much everywhere. Just walk along the beach and you’ll see them grilling. Ask them to put extra chori because they usually just put 2 pieces in a small bun hehe. Well, I live for the perfect burger, so I’ll find it. But what is “Chori”? Chori is short for chorizo, a type of pork sausage. They have a special sauce that comes with it. I heard a lot of things about Thailand especially the gorgeous beaches. Might as well try Koh Samet after traveling Bangkok. Thanks for the heads up! Thanks for posting. ANd I checked out your link. Beach House Aruba looks awesome!! Oh man, you reminded me about the amazing food one can get for SO cheap in Thailand! And after the ice storm we had here in Toronto last night, I am totally wanting to be on that beach right now. Agh. Hey Cafe!!! Thanks for stopping by! Yeah, in fact, I am now in Manila escaping the Tokyo cold. But it’s surprisingly expensive here for food. Nothing beats Thailand for super-reasonably priced food that is also amazing. I think you need to jump on a plane and thaw out a bit in SE Asia! Hey Mike! Hope you’re having a great time there (and not starving yourself hehe). Are you staying there for Christmas and the rest of the holidays? Will see what you get up to! Have a great time, Mike!!! Thanks!! So have you been to Boracay yet? It’s definitely the best beach I’ve seen so far in Asia. But it’s also crammed with package tourists from Asia, so it’s hardly one of those hidden treasures we all look for. Yes, I’ve been there and I had an amazing time. I really loved the beach. And I went during low season so it wasn’t as packed as I hear it gets! Well, have an amazing holidays, my friend, and don’t forget to tell us all about it! Koh Samet Island, I never been in Koh Samet Island but as the information has been shared. So I personally feel. I must go there with my close friends & family to enjoy Koh Samet Island 🙂 well let see when life gives opportunity. Anyone, how’s Koh Samet compared to Boracay in Philippines ie; prices for accommodation, food, atmosphere? We’ve never been to Boracay but been to Samet soo many times and we love it there but prices getting up there and we feel like we need a change. Samed is still cheaper overall…but it’s lost its edge on that. It’s pretty damned expensive now. As for food, Filipino food is mostly for the locals. 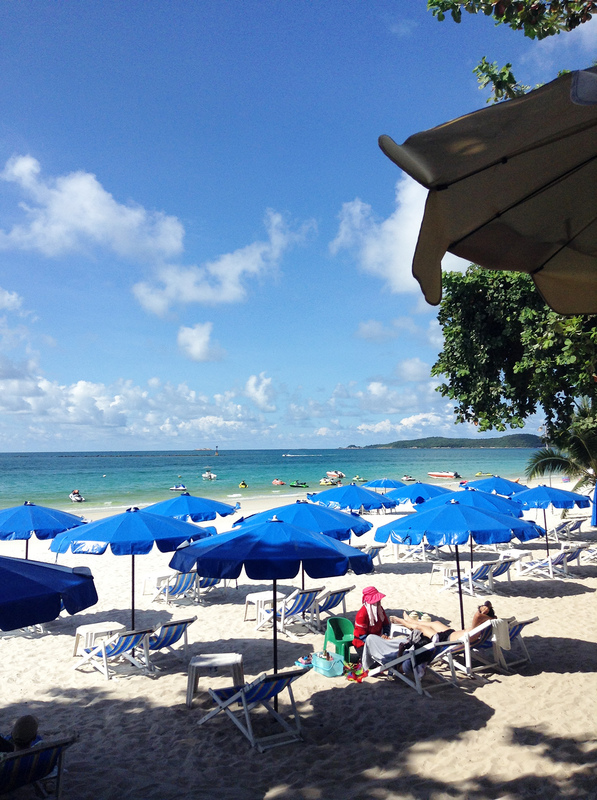 Tourists mostly avoid it, so Boracay is packed with western and Asian food options. But that beach in Boracay…damn!!!! It’s amazing. So yeah, check it out. Just avoid Station 2 area unless you enjoy being in a sea of Korean package tourists.